Alex lives with his wife Alejandra (Ale) in downtown Mexico City, just blocks from the Plaza de la Constitución. Alex is a K3 teacher in the American School Foundation, while Ale is a professional tour guide who is passionate about sharing her Mexican culture and cuisine with guests. Ale has a wealth of knowledge about the country's history, anthropology, folklore, and of course, culinary traditions. 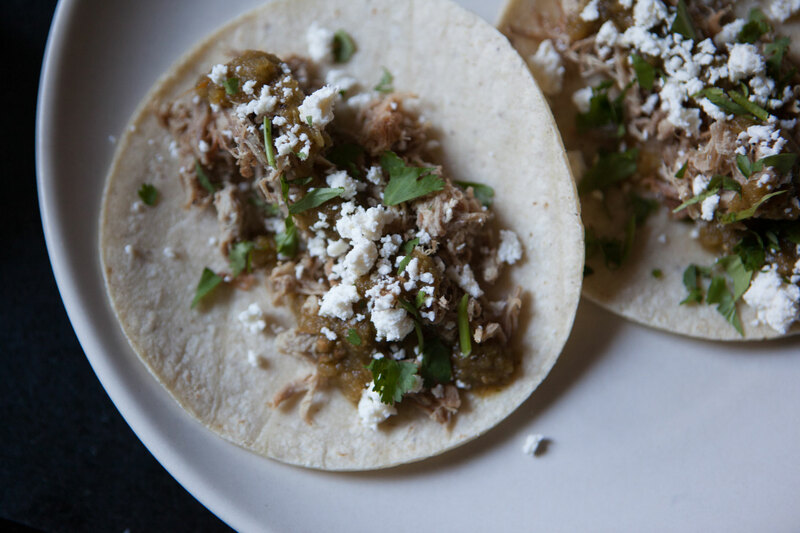 Alex drew inspiration to cook from his grandfather who would serve delicious nopales (grilled cactus paddles) at his home every Sunday. He learned to cook watching his mother and experimenting in the kitchen after watching food shows on TV. The smells and flavors of his childhood and family meals inspired him to cook more, and now he loves sharing this knowledge with his 6-year old students during their regular cooking class. Both Alex and Ale love sharing meals with friends and family as much as they enjoy cooking. 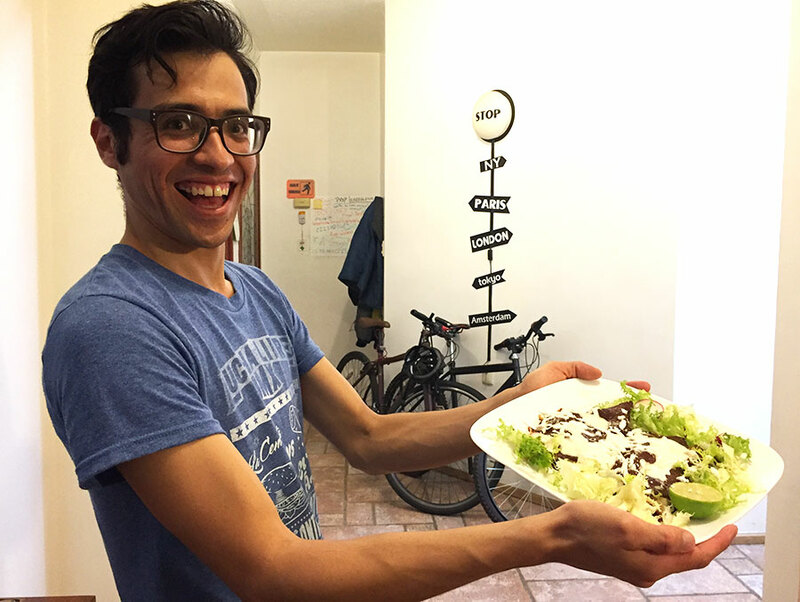 In-home meal: (1-6 guests) Enjoy a homemade Mexican meal in Alex and Ale’s simple yet modern and vibrant apartment. 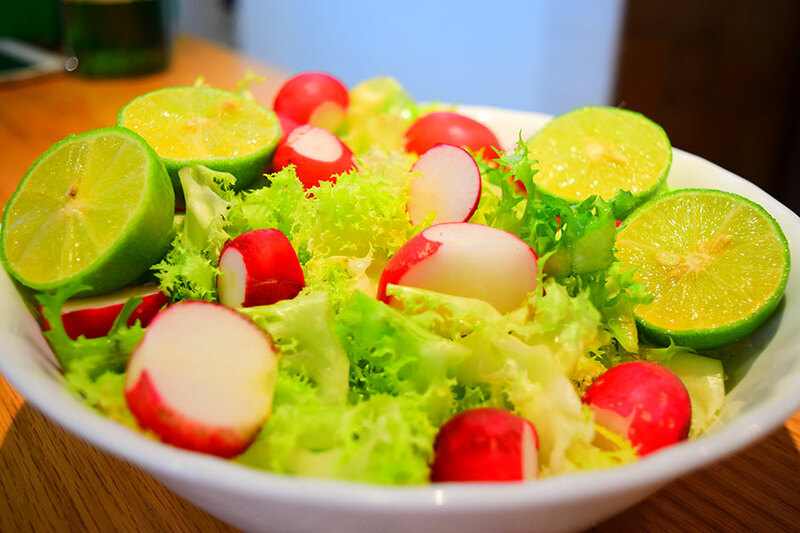 The food that they serve is a mix of modern Mexican dishes as well as Pueblan cuisine, where Ale comes from. While you sip on your welcome drink, Alex and Ale will talk to you about the importance of food in Mexican culture. 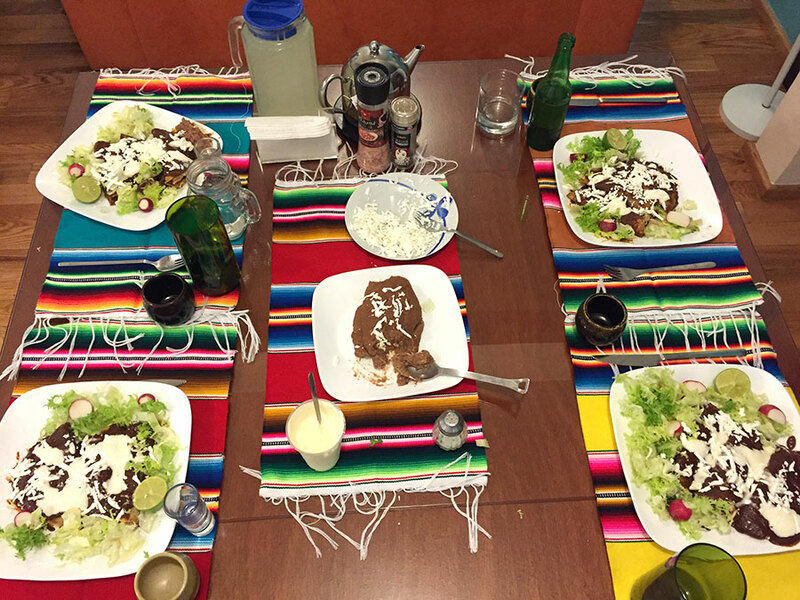 Then sit down together to enjoy a meal that includes 3-4 dishes and one or two salsas followed by a dessert. Your meal will be accompanied by beverages like fresh hibiscus water and if you select alcohol, beer and mezcal. 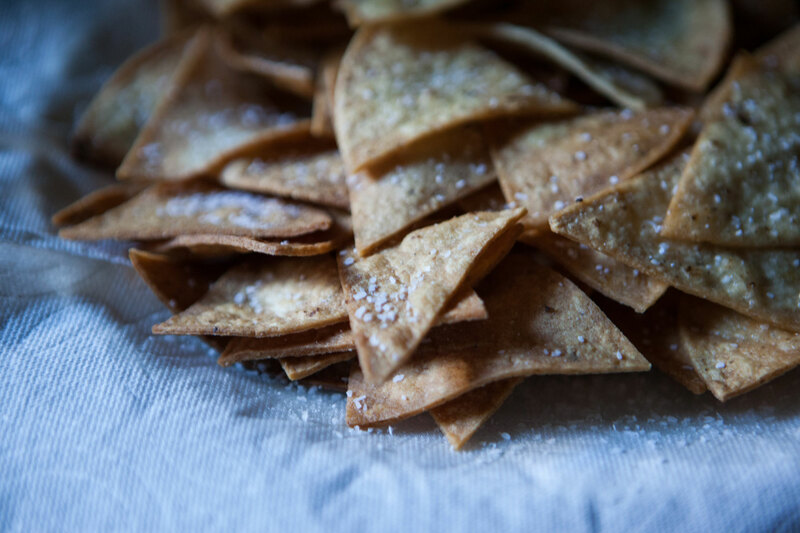 Your menu may include traditional and modern Mexican dishes such as picadillo tostadas, enmoladas or flautas or a variety of tacos which will be served with a selection of salsas like salsa verde or roja. Your meal will conclude with a dessert like sweet Mexican corn cake. 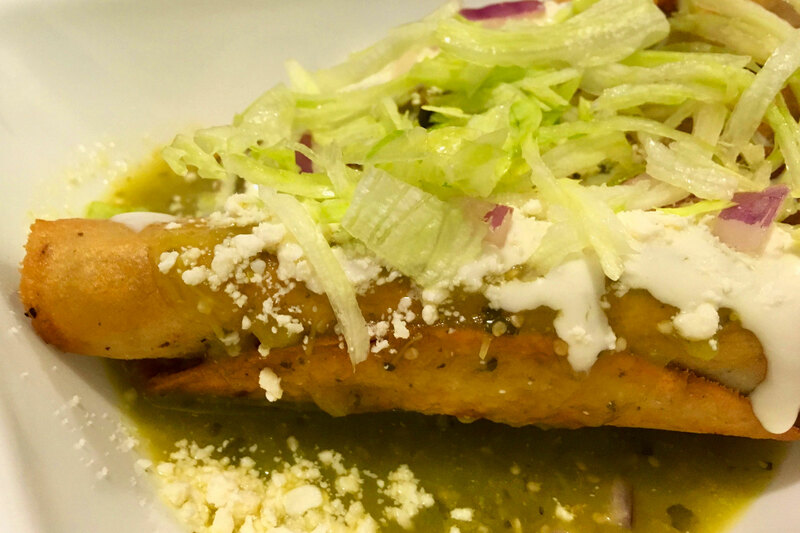 If there is a particular Mexican dish you are eager to try, please let Alex know when making your booking. 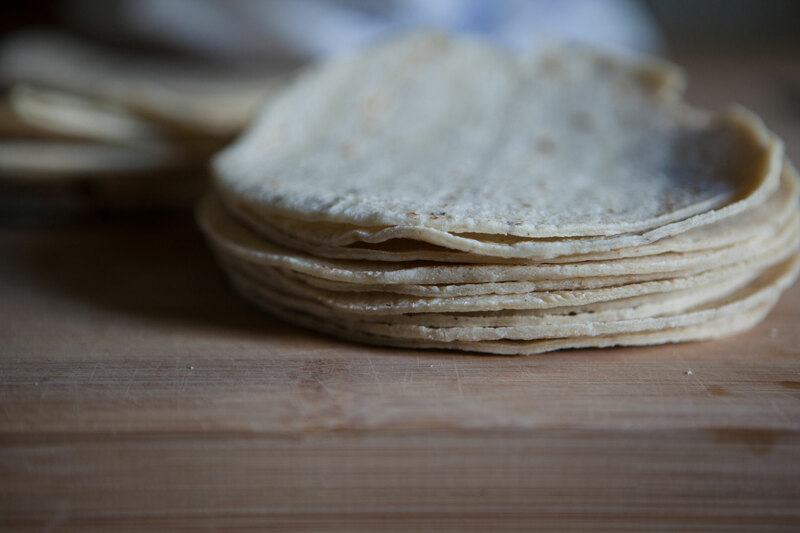 Cooking experience: (1-4 guests) Join Alex in the kitchen to learn to make 3-4 traditional Mexican dishes including a homemade salsa. You might learn dishes such as flatuas, tostadas or enmoladas which are corn tortillas stuffed with chicken in a mole sauce. 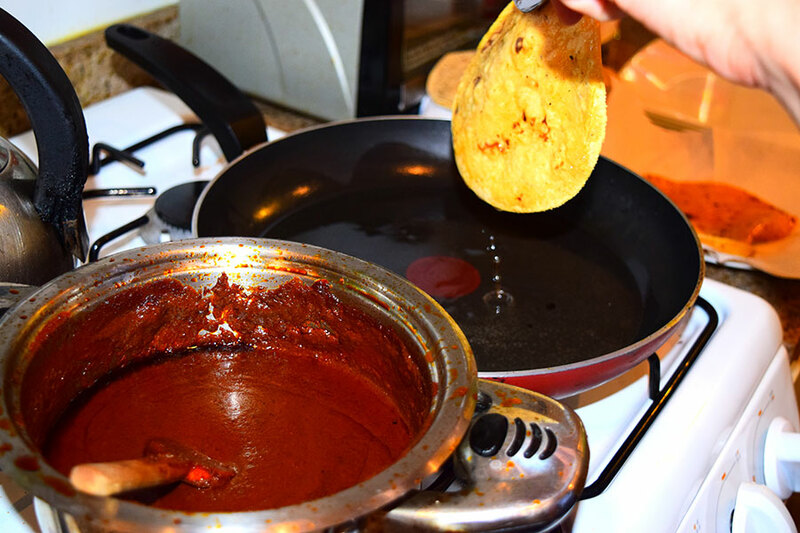 Mole is a dark chocolate-based sauce with lots of spices that is very popular in Mexico and easy to cook - a great sauce to add to your Mexican cooking repertoire. As Alex and Ale have a small kitchen you can expect to do the cooking preparation in the bar area and use the kitchen for the final cooking. You can also let Alex and Ale know at the time of booking if you want to learn a particular dish. 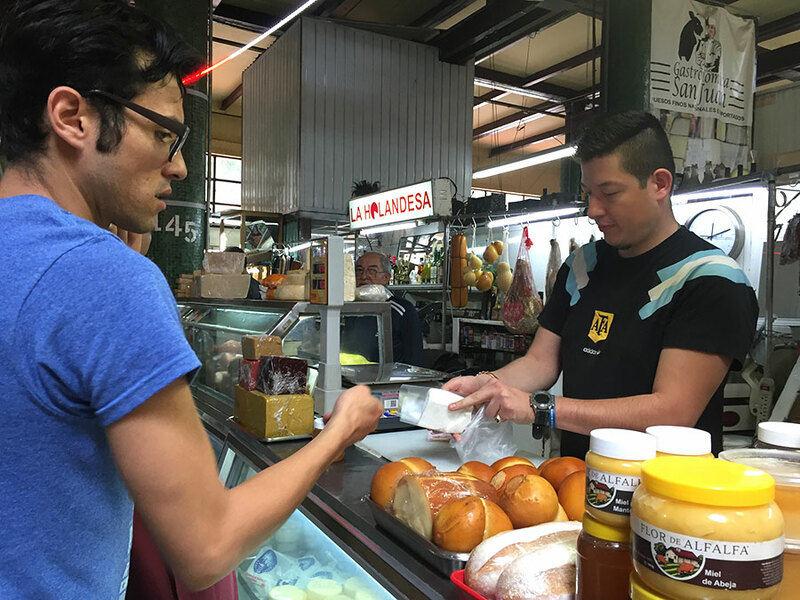 Market visit: (1-4 guests) Alex and Ale will accompany you to the San Juan market, a traditional Mexican market in the historic center of Mexico City that specializes in gourmet and exotic foods. It is known for its selection of exotic meats, including venison, crocodile, wild boar and even lion meat. 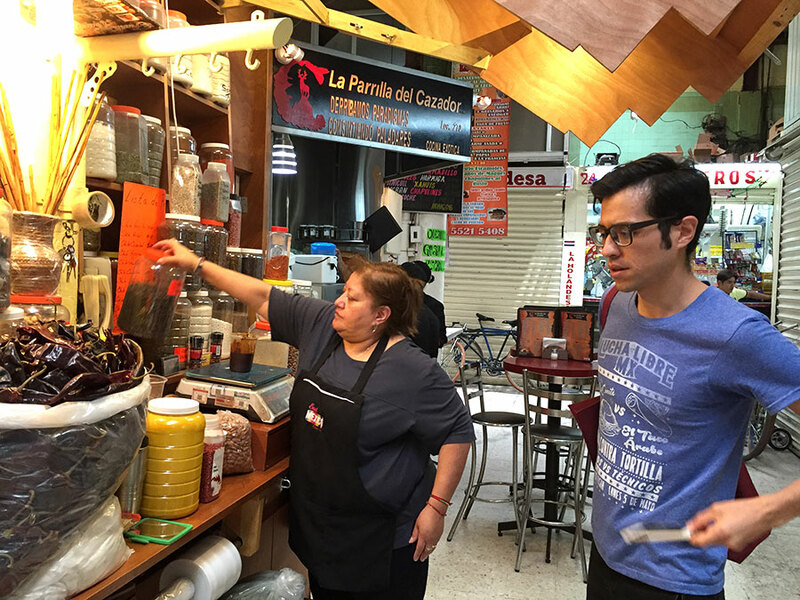 Alex and Ale will guide you through the market and describe the different items for sale, from fresh produce to dried chiles, spices, mole mixes, and much more. As you tour the market you might taste a few local specialities before walking home together to begin your cooking experience. Please make sure to meet Alex at his home on time for your market tour as the market closes at 5pm and he does not want you to feel rushed. Notes: This experience is great for travelers traveling with children. As Alex works during the day, he can only do dinners (not lunches) on weekdays. Market tours + cooking class + dinner are unavailable on Wednesdays. On weekends, Alex and Ale are available for any experience type for both lunch and dinner. This was such a special experience. Alex and Ale have a lovely home. Ale was not able to attend but Alex made me feel like a welcome friend. The tour of the San Juan market was both informative and delicious. The cooking, the meal and the dinner conversation were all first rate. Highly recommend! The best, most memorable part of our trip! What an awesome experience exploring and shopping at the beautiful market, cooking wonderful food and enjoying an incredible meal with Alex and Ale. They made us feel so welcome, like we were enjoying a meal with old friends. Don’t miss this experience!! An excellent experience. 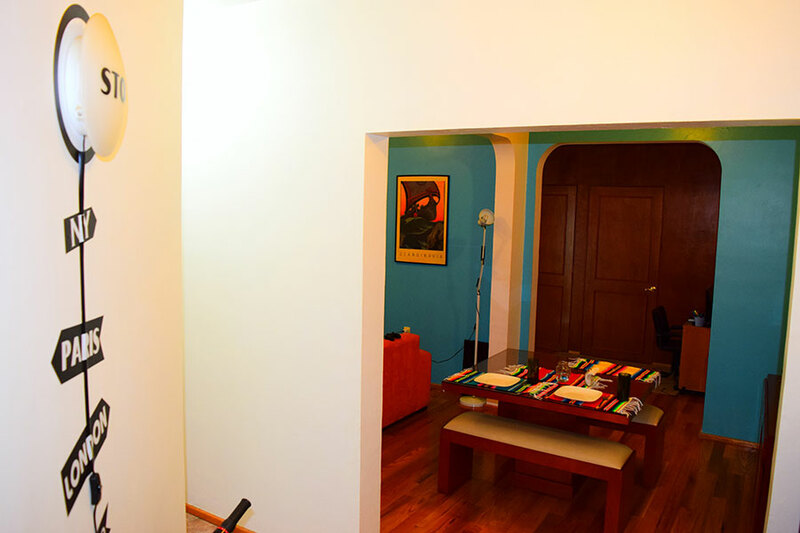 My friend and I had the best day with the charming young couple in their apartment in Mexico City. They were both so knowledgable and warm and friendly. We visited the San Juan market, which was so interesting. We saw fresh tacos being made, and were allowed to sample them along with other samples as we wandered around the market. The chicken flautas we all cooked along with all the accompaniments were all delicious. Cannot praise our experience enough. Many thanks to Alex and Ale, our hosts. We felt like two more Mexico downtown residents during the time we spent with Alex and his wife Ale. 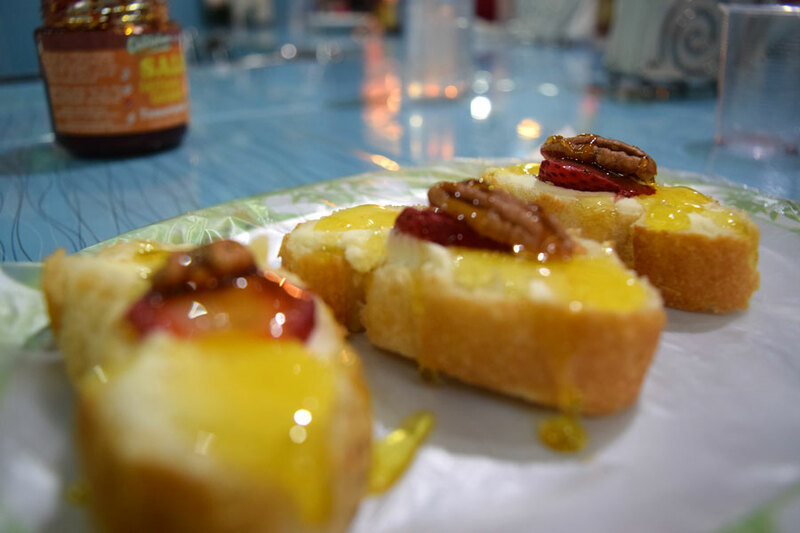 First in the exotic market of San Juan, where Alex invited us to try some gourmet baguettes (mascarpone, honey, strawberry and pecan nuts) before showing us the most typical stands there (which include tiger and crocodile meat! 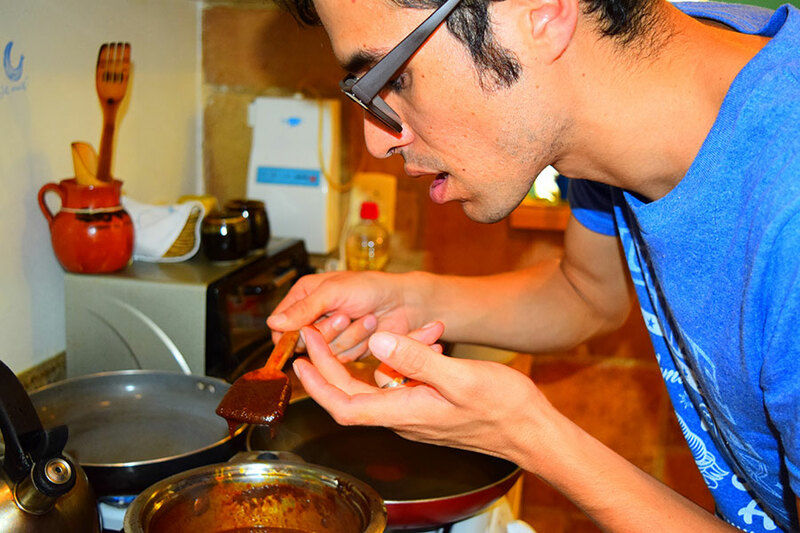 ), then while cooking enmoladas and philosophizing about gastronomy and Mexico, sipping mezcal. Our time with Alex and Ale was fantastic. They were both extremely friendly and easy to talk to. They provided us with a great experience and tons of local knowledge. The food we prepared was amazing. Traveling Spoon gave me the chance to connect with a city in a way I had never thought possible. It is one thing to go to a city and travel around but another entirely to get to interact with the people within it. I always find something missing from my usual vacations, something real. But with Traveling Spoon, I felt I actually connected with the culture and learned something about both Mexico City and myself. It was a phenomenal experience that broadened my horizons.